My brush collection exploded somewhat in 2014. I feel like there's a kind of path that most people take when they start to get more and more into beauty products, with the focus shifting through different products over time, and I think that the brush obsession stage hits all of us at some point. Or at least, that's what I'd like to think. Not gonna lie, my collection is kinda ridiculous at this point and I know that I should probably go through and pare down my collection somewhat... but why would a junkie collector like me want to do that? Anyway. Even with a huge collection of brushes, I find that there are the ones that I find myself reaching for every day over all the rest. This was actually the hardest list to compile so far, but at the end of the day I feel pretty good about my choices because they really are my most used brushes this year. I suspect, however, that this list could end up being very different next year. This brush is huge. Seriously. It's hard to tell from the pictures, because they just don't do justice to the massiveness of the head of this brush, but it is definitely bigger, fluffier, and more dense than any of the other powder brushes in my collection. I love that about this brush. Now, I will say that I have felt fluffy powder brushes that are more high end that are a fair bit softer than this one, but for the price point on this one it absolutely can't be beat. I haven't had any issues with shedding when it comes to this brush and it cleans very well. I do like to use this for powder foundation or all over setting powder, but my preferred use for it is bronzer. I like to pinch at the base to flatten the bristles to apply the product and then release to blend it out and I feel like it gives a really nice, blended, natural effect on the skin. I feel like this brush should have come either first or last in its placement in this list because it just might be my all time favorite, all time most used brush in my collection. So far, I've given this brush to different friends of mine for two Christmases in a row because I feel like I have to share the wonder of this brush. The domed bristles on this brush are short and densely packed, pinched together slightly at the base to flatten the brush out just slightly. This is the perfect brush for both buffing and blending in foundation onto the skin and also stipple blending concealer for a flawless look. I feel like this brush makes it a no brainer to apply just about any cream or liquid face makeup, because it just gives the perfect finish no matter what the texture of the product is. Definitely a favorite. I wish Real Techniques was making a higher end version of this with their Bold Metals collection because I'd probably buy three. This set was a little bit hit and miss for me, but I almost feel like this brush alone makes up for every complaint I have with this set. I realize that other brush brands have blending brushes this big and fluffy, but this is the first one I've owned and I am a complete convert. This is the perfect brush for applying a transition shade and that is definitely my favorite way to use it, but I also love it for blending out the edges of pretty much any eye look so that it looks just flawless. I have a feeling that this brush may have started a buying trend for me, because I want to own every big, fluffy eye blending brush on the market now. For the time being, however, I'm good with just this one for the time being. It's getting it done. First off, I don't use this for blush. I actually prefer to apply my blush with an angled brush with more densely packed bristles. I definitely didn't buy this brush for that purpose, though I suppose it would be a good brush for a really precise application of blush. For me, this is a setting powder brush all the way and that's why it's getting so much use. My favorite product to use this brush with is my Hourglass Ambient Lighting Powder in Dim Light, which is my favorite product for setting my underye concealer and doing a little bit of brightening. I feel like the shape of this brush is perfect for dusting the powder in that area and getting nice and close to the eye without having to worry about stabbing my eyeball. It's fairly flat with a pointed tip and slightly fluffy bristles. This would also be a good brush, I think, for applying a sharp but blended contour to your cheekbones. I actually really like all of the e.l.f. Studio Brushes that I've tried and think they're some of the best at the drugstore, and also some of the most affordable. Choosing an eyeshadow brush was probably the hardest choice, because I have a lot of brushes that are very similar to this one, but this one is definitely the one that gets pulled out the most and has held up over the probably two years that I've had it. This is a soft, fluffy brush with bristles at varying lengths. My favorite use for this brush is actually to blend out the edges of various cream shadows, because I feel like it has just the right shape and fluffiness to give a really soft blend without removing any of the product. This is also a good brush for applying shadow all over the lid as well as into the crease, since it does come to a nice point at the tip. Overall, I think this is one of those brushes that everyone should own. Thusly, we have reached the end of the Week 1 of my Top 5 of 2014 favorites posts. Come back next week for the continuation of this series and another 20 of my favorite products from the past year, including Skin Care, Hair Care, Body Care and Random Products. 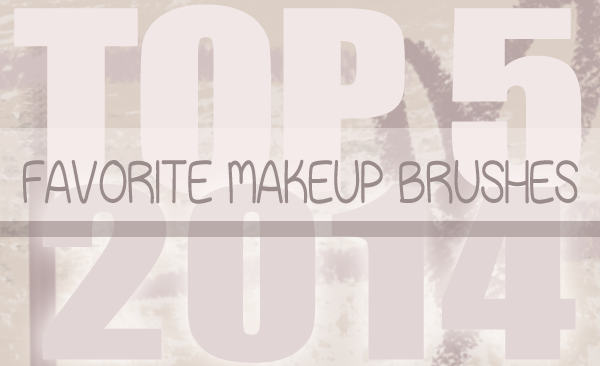 What brushes rung out as your favorites over the last year?